Cambridgeshire County Council’s streetlighting contractor Balfour Beatty will soon be returning to Queen Edith’s for the next phase of streetlight replacements. This is part of a countywide PFI programme to change all the streetlights in Cambridgeshire to a new, more energy-efficient type of light that will deliver energy savings of nearly 50%. The new lights are taller and we are told they illuminate a wider area. Worse still, the Council agreed to a reduction of the total number of lights by 10%, and many smaller streets are losing more than that. Although this is leaving dark patches in many streets (such as Hinton Avenue picturd above), Liberal Democrat proposals to have lights reinstated in badly hit streets have been voted down by the other parties on the Council. Please let me know if you would prefer to look at a printed plan. The county Council’s lighting contractor Balfour Beatty is working with the cycle lanes contractor to synchronize their activities on Hills Road. 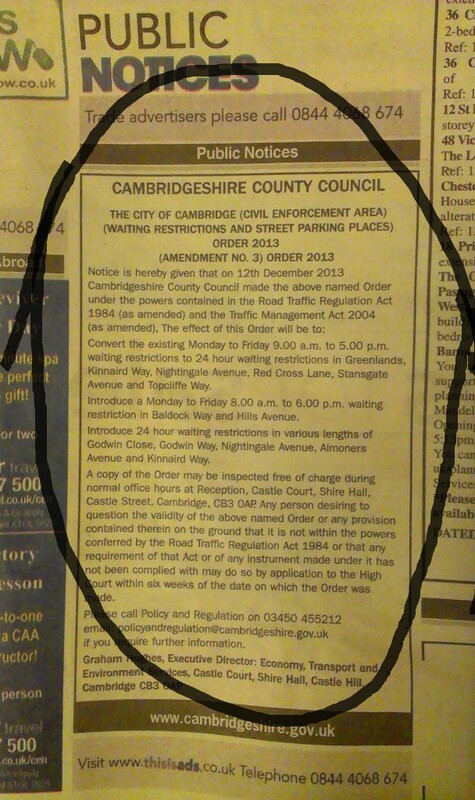 We are pleased to say that Cambridgeshire County Council has at long last brought into force the parking restrictions they advertised in 2012. Many are double yellow lines superseding single ones, while others are completely new ones, as in Almoners Avenue and on junctions near schools. We sincerely hope that this will give relief to residents from commuter parking and inconsiderate parking on corners. I’m keenly aware that there will be some displacement parking; what we cannot tell is how far this will go; or to put it another way, how far people will walk to work. I shall be keeping a close eye on what happens over the next few months. I am also meeting residents in streets where the Council’s proposals were not accepted. Hills Road VI Form College is another car magnet, and the roads off Hills Road are used by students and staff during the day, particularly inconvenient for those who do not have their own drives. Some of these roads are very narrow and the Fire Service has raised concerns. I have asked officers to propose some solutions, and they will be consulting soon. Addenbrooke’s is an outstanding hospital, but the thousands of cars it attracts pose a problem for those of us living nearby, earning the south of Queen Edith’s the sobriquet of the ‘Addenbrooke’s Overflow Car Park’. Last year, Cambridgeshire County Council advertised a raft of parking restrictions, some new yellow lines and some extensions of existing ones, for example, making them effective seven days a week instead of just Monday to Friday. I have been pushing the Council’s Highways officers to get on with the restrictions that they advertised last year as the first step of the Parking Review. Most of these were agreed last spring under Geoff Heathock’s watch as county councillor, but the yellow paint has still not hit the streets. The Council plan is to have the yellow lines in operation week beginning 16th January, weather permitting. I had hoped to have them in place before Christmas, but given we are getting so close, the decision has been taken to wait until the New Year, so as not to make life difficult for your Christmas visitors. I have asked officers to propose some solutions, and they will be consulting in the New Year.